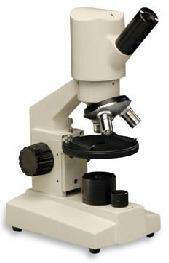 Bring the latest microscope technology to both your teaching and learning events. The built-in 0.3 mega pixel camera and Motic® software let you see the big picture – LIVE – right there on the computer screen. With PC and Mac compatibility, USB 1.1 or 2.0 connection, and rechargeable batteries, this digital compound microscope offers the best buy for every digital need – teachers, students, hobbyists, and even professional lab work! The B-02000 is designed for comfort, safety, sturdiness, and ease-of-use. The inclined, 45° eyepiece is situated for viewing ease while seated, but it’s also highly convenient for children to comfortably use as well. In addition, the rugged construction – metal frame, rack stops, and slip clutch – provide some of the highest levels of durability in any microscope package on the market. "Simple" is key with the B-02000. With color-coded objective lenses, you won't be spending time figuring out which one you need, and a unique feature of this microscope is its oversized focusing knobs that provide mid-range focus along with the standard coarse and fine focus. Also highly useful is the revolving turret position that allows for ease of viewing by more than one person as well as simplifying specimen placement. Finally, the built-in camera and Images Plus software package that are simple and easy-to-use, with drop-down menus for handling files, straightforward icons for image manipulation, and on-screen image correction controls. All in all, the B-02000 is one of the best digital microscopes available today - advanced, low priced, fun, and easy-to-use!